“Trouble in paradise” takes on new meaning! Because that’s exactly where the developers of Leilani Estates, Hawaii built a subdivision on the Big Island—an extremely dangerous location destined for LOTs of “Trouble in paradise”. Are the rest of the real estate insurance policy holders in Hawaii supposed to subsidize those who made such a foolish and disastrous decision? Really, how does anyone build their dream home on the side of an active volcano. More significantly, how does the state permit such an inevitable flaming fiasco? Oh, that’s right, the expansion of the tax base guarantees an additional stream of property tax revenues. As usual, it was bad government that allowed this slow-motion catastrophe to occur in the first place…at our collective expense. Democrat-dominated blue states like Hawaii will find every way possible to raise taxes, legislate new ones or approve tax-generating projects that simply shouldn’t be there. As for the developers, they’ll build inside of a volcano cauldron if given the green light to do so. Those folks couldn’t care less once the deal is closed. Incidentally, the state of Hawaii currently has 5 active volcanoes dotting the landscape. Which means there’s a LOT of other real estate at great risk and, therefore, likely to be a lot more trouble in paradise . N.B. Now see below what it’s really like to have an angry volcano as your next-door neighbor. More residents of Hawaii’s Big Island have been told to evacuate as fast moving lava threatens homes and businesses after a new, explosive eruption took place at Kilauea’s summit crater Saturday as well as the emergence of fresh, faster flowing lava throughout the region. Some 22 fissures have opened up in the lower Puna district since the eruptions began over two weeks ago, claiming at least 44 structures in the affluent Leilani Estates and Lanipuna Gardens subdivisions. Residents across the Ka’u region have been advised to prepare for “rapid changes in air quality” due to the potential for ashfall or increased levels of sulfur dioxide. As of Sunday morning, powerful lava flows had crossed a highway and begun flowing into the Pacific ocean – sending “hydrochloric acid and steam with fine glass particles into the air,” according to County officials. The combined lava flow from fissure 20 advanced 1,000 feet in less than an hourearly Saturday morning, and moved toward the coast at a rate of 300 yards per hour. “With fresher, hotter magma, there’s the potential that the lava flows can move with greater ease and therefore cover more area,” said Janet Babb, USGS geologist, earlier in the day. “The rift zone is being forced apart,” added Steve Brantley of the USGS. 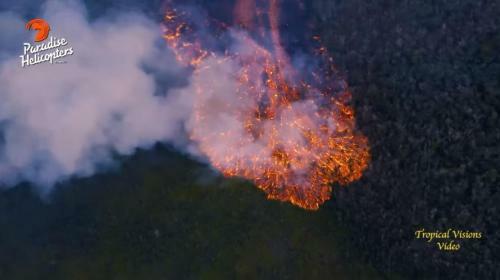 “I think clearly it points to the potential for additional eruptive activity” in lower Puna. On Wednesday, around 125 shallow quakes rattled Kilauea’s summit and nearby communities, causing minor damage to structures and roads. The strongest quake in the area was a magnitude 4.4, and dozens more have been upwards of magnitude 3. “It’s been like hell,” said resident Ikaika Marzo, who has been helping get much-needed information to those in lower Puna.